Rated 4.6 out of 5 stars.144 total votes. The Cuisinart 13 piece wooden handle grilling set, with 12 individual grill tools inside a recycled plastic case, is a simple and effective way to equip any grill-master for the season. Each tool is cut from durable stainless steel and set in robust wooden handles emblazoned with the Cuisinart brand. The spatula, fork, tongs and grill brush also have convenient leather straps to easily hang them on your grill hooks. The recycled plastic storage case keeps tools organized and dry when traveling or cooking anywhere outdoors. Perfect for picnics, camping and boating, this portable set can handle anything you throw on your grill plus it makes a great gift. Cuisinart is universally known for introducing America to the food processor. However, the prestigious brand is not limited to electric appliances. With its full range of high-end quality cookware and grilling accessories, Cuisinart covers the gourmet outdoor kitchen like no other! Cuisinart is a full-service culinary resource with a wide array of products, preferred by chefs and favored by customers. When you buy a Cuisinart 13 Piece Grilling Tool Set online from Wayfair, we make it as easy as possible for you to find out when your product will be delivered. Read customer reviews and common Questions and Answers for Cuisinart Part #: CGS-W13 on this page. If you have any questions about your purchase or any other product for sale, our customer service representatives are available to help. Whether you just want to buy a Cuisinart 13 Piece Grilling Tool Set or shop for your entire home, Wayfair has a zillion things home. Exactly what we needed and they are good quality. Great set. Bought it for my Granson for a wedding present. This was a wedding gift that was a hit! The couple can't wait to get grilling! It's well-made, the case makes it easy to keep track of everything, and it's a great starter set for anyone interested in barbecuing at home. These tools are great. My only concern is that the latches on the case are plastic, and pretty cheap, so they don't stay closed as well as I like. We have these as gifts. I trust the cuisinart brand! Excellent product, well-made, very happy. The utensils are hard to get out of the container. Overall nice. Easy to clean. BBQ 16-Piece Grilling Tool Set has all the essentials you need for a successful summer cookout. Each tool is made from high quality and durable material and is also rust resistant for long-lasting use. This set includes a variety of BBQ tools like a spatula, tongs, skewers, corn holders, basting brush and it also comes with a heavy-duty carrying case for storage or travel. It is the perfect gift for anyone who loves to grill outdoors or for occasions like birthdays, wedding showers and more. The Cuisinart 13-piece bamboo BBQ tool set is a simple and effective way to equip any grill master for the season. Each tool is cut from durable stainless steel and set in bamboo handles emblazoned with the Cuisinart brand. BBQ tools include a chef’s spatula, silicon basting brush, locking tongs, 4 stainless skewers, 4 corn cob holders, and a cleaning brush with palm stalk bristles. The durable bamboo case makes storing and traveling with your set a breeze. This unique BBQ tool set can handle anything you throw on your grill and it makes a great gift. Rated 4 out of 5 stars.174 total votes. Rated 5 out of 5 stars.12 total votes. This NFL 8 Piece Grilling Tool Set have sturdy stainless steel handles. The aluminum carrying case features a metal carved with enameled finish. BBQ 23-Piece Grilling Tool Set with 4 steak knives has all the essentials you need for a successful summer cookout. Each tool is made from high quality and durable stainless steel with riveted wood handles for rust resistant, long-lasting use. 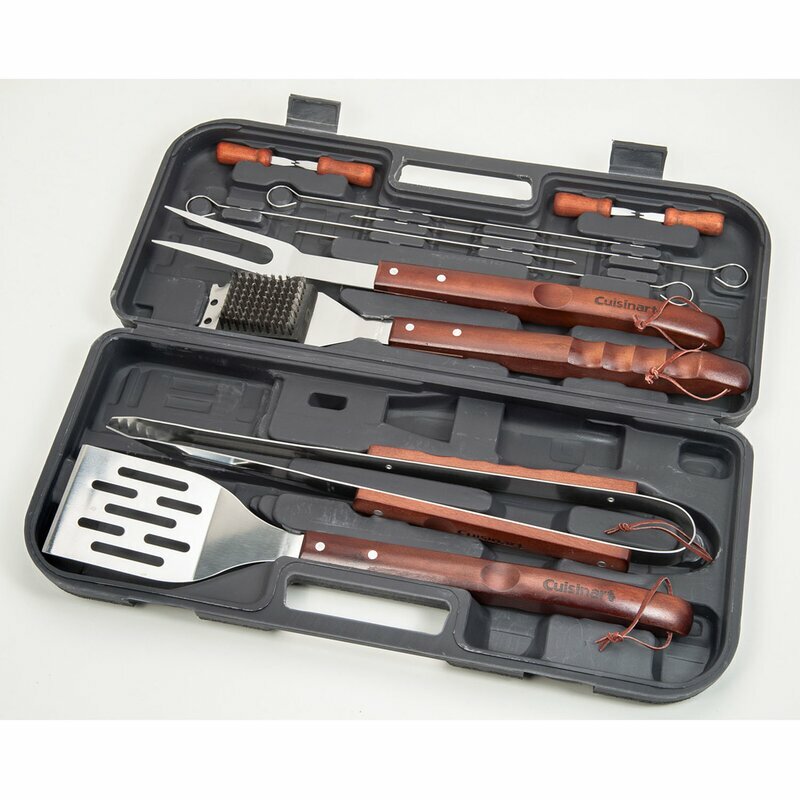 This set includes 18 BBQ tools like a spatula, tongs, skewers, corn holders, basting brush which can all be stored in the included heavy-duty carrying case. The full set also includes 4 steak knives for when you cook up perfectly seasoned meals. It is the perfect gift for anyone who loves to grill outdoors or for occasions like birthdays, wedding showers and more. Rated 4 out of 5 stars.17 total votes. Cuisinart's 36-piece backyard BBQ tool set offers many unique items to get you started on your grilling adventure. This comprehensive set includes tongs, spatula, fork, bottle opener, grill scraper, grill temp reference magnet, cooking guide, basting brush with 3 interchangeable heads, 1 silicone grilling glove, 6 skewers, 10 burger marking flags, 8 corn holders, and a robust carry case to store it all. The steel burger flags are a very cool way to serve and mark your burger temperatures for those big family barbecues. The stainless steel grill scraper is a one of a kind way to scrape down all of the grill grime without leaving any bristles behind. Rated 5 out of 5 stars.25 total votes. Neatly organizes and holds your utensils in one convenient place. Each utensil has its own designated pouch, so units don’t get smeared, scratched or damaged in storage or in transit. Provides easy access to your cooking utensils and it is equipped with a secure zip seal. Made with tough woven cotton, it protects your utensils from the elements, falls, and it has multiple compartments, so flatware stays sturdy and doesn’t clatter during transportation. In the case of a fall, the thick woven cotton outer shell casing will prevent your cutlery from getting scratched, marred or disfigured. Can be used for multiple applications, perfect for concerts, sporting events, hiking, boat rides, mountaineering and BBQ’s. The weather retardant the travel utensil kit is the perfect camp kitchen accessory, and it holds all your essential outdoor cooking utensils. Rated 4 out of 5 stars.78 total votes. The Top Chef Stainless Steel 5 Piece BBQ Set provides a solution for all your grilling needs. Each tool in the set has a 420 stainless steel head and an aluminum handle, which makes it easy to use and sturdy. The hollow aluminum handle maintains temperature and provides with a comfortable working temperature. 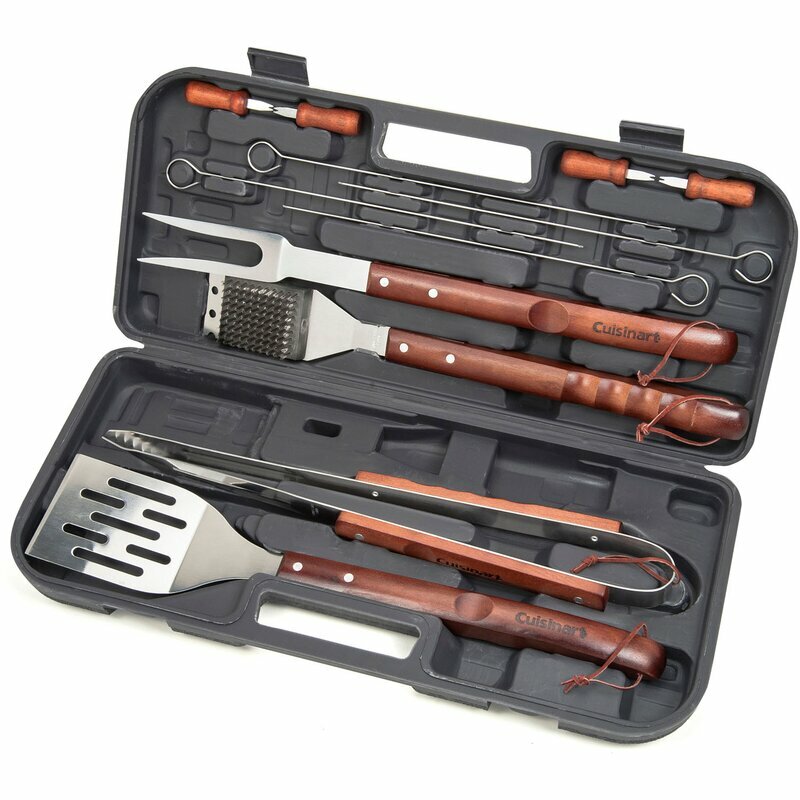 The versatile BBQ set is available with laser etched “Top Chef” logo on each and every tool. The spatula features a bottle opener, serrated edge and tenderizer. The Stainless Steel 5 Piece BBQ Set by Top Chef is rust resistant that retains its quality for a long time. Rated 4 out of 5 stars.57 total votes. Bring a touch of style to your grilling area with Mr. Bar- B-Q Tool Set in Black Aluminum Tire Track Case (Set of 18). Keep this grilling tool set handy when you are at the grill. The Tool Set in Black Aluminum Tire Track Case (Set of 18) from Mr. Bar-B-Q has all the tools a griller needs. This ideal grilling tool set includes a 4-in-1 spatula, fork, tongs, basting brush, 8 corn holders, 4 skewers and one knife in a durable aluminum case. This durable grilling tool set features aluminum handles that fit comfortably in your hands. This grilling set with aluminum case is the perfect set for providing a relaxed barbecue with family and friends.